The U.S. government took its first steps to repealing the Affordable Care Act (ACA) on Monday, with House Republicans releasing a detailed proposal in Congress. The proposal repeals much of the ACA and replaces it with a plan to help people buy insurance if they are not provided one by their employer. This is proposed to be done by creating a new tax credit tied to an individual’s age and income. The details of how many people will lose or gain insurance or the impact on the cost of health insurance are unclear at the moment, but at least one major health insurance player is largely safe from this uncertainty – UnitedHealth Group (NYSE:UNH). UnitedHealth Group, the largest health insurer in the U.S., exited a majority of the health insurance exchanges last year after facing heavy losses. 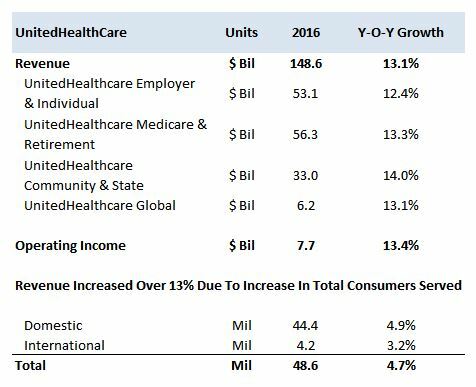 This helped the company’s UnitedHealthCare division post operating income of $7.7 billion in 2016, an increase of 13% year-over-year (y-o-y) while keeping its operating margin stable at around 5.2%. Solid performance by the UnitedHealthCare division came in addition to the robust growth reported by Optum – UnitedHealth’s pharmacy benefits management (PBM) and health care services division. Optum has been the primary growth driver for the company in the last few years, and it continued to drive results in 2016 as well. 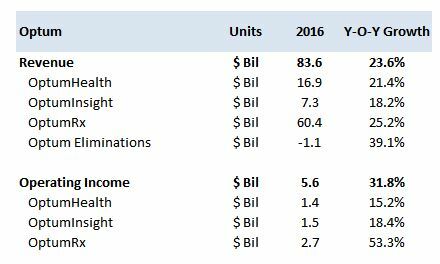 In 2016, Optum revenues grew about 24% year-over-year (y-o-y) to $83.6 billion, driven by growth across all three sub-segments- OptumHealth, OptumInsight, and OptumRx. The aforementioned factors highlight how UnitedHealth has gradually made its earnings independent of the ACA, so a potential repeal of the act likely would not have a significant impact on the company. Further, the potential removal of the provision requiring all health plans to provide minimum benefits could help the bottom line for the insurer. This provision, although beneficial for users, increased costs for insurers, and its removal could help improve profitability. Moreover, the draft proposes to make it easier for insurers to easily compete across states, which could help the company grow its user base. While there is still significant uncertainty regarding whether the new healthcare plan will pass, it is unlikely that UnitedHealth will be adversely impacted either way.